76) Peter Ball and Co.
Thirlestaine House was designed and largely built by James Robert Scott between 1820 and 1823 as his private residence. Mr Scott was an amateur architect who also owned property in Roxburghshire in Scotland. He visited the town on several occasions before deciding to build here, during which time he met and, in 1823, married Harriett Gray, the daughter of Thomas Gray of Cheltenham. 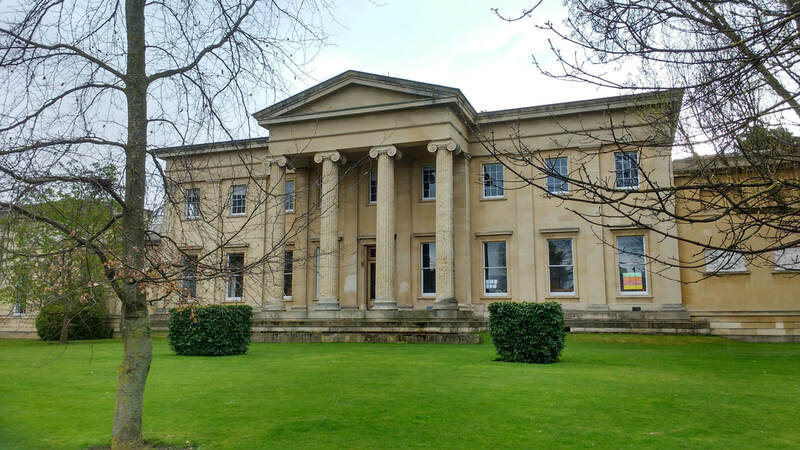 ​The house, which originally consisted only of the central portion, has been described as the most substantial private house ever built in Cheltenham. It is in the Neo-Classical style, the most notable feature being the grand portico with four fluted Ionic columns and a pediment. David Verey, writing in 'The Buildings of England', stated that Scott had brought the Grecian style of architecture to Cheltenham in its most learned style. The house was originally approached from two entrances on the Bath Road by means of sweeping carriage drives. As now, it was fronted by a large lawn but also had substantial beds of flower or shrubs. There were porter's lodges on each corner of the property to ensure privacy. At the rear of the house was another great block containing stables, offices, a conservatory and a grapery. In addition there was a paddock for the horses, a kitchen garden and a fruit and flower garden. Although apparently not quite completed, Thirlestaine House came up for sale in February 1831, when it was described as a "splendid freehold mansion", on the outskirts of Cheltenham, that had cost Mr Scott the almost unimaginable sum of nearly £100,000. The house was said to have a grand suite of 5 rooms connected by massive double doors and a kitchen and cellars similar to those at the Royal Pavilion in Brighton. Whatever circumstances necessitated the sale, Mrs Harriett Scott died in April of that year and the upset must have been considerable. ​The house did not sell at the auction in London in June 1831 and Mr Robins, the auctioneer, was then instructed to sell the property "at any sum" that might be offered. The sale now included all of the silver plate, china and glass, a library of books, the furniture and a travelling chariot. Further tragedy befell the family in April 1832, when James Robert Scott also died at his residence in Scotland. He was said by his distraught family to have been "in the prime of life". Still the house did not sell and it was auctioned again a few years later, in 1836. It was finally bought by John Rushout, 2nd Baron Northwick, who already owned Northwick Park, near Blockley. Lord Northwick, an avid collector of fine art, was often to be seen at Christie's auction rooms in London. He decided to extend Thirlestaine House, to accommodate some of his growing collection, by adding two wings in 1840, making the entire length of the building about 300 feet. The gallery included works by Titian, Leonardo da Vinci, Holbein, Bellini, Rubens and Velasquez and the collection was acknowledged to be one of the finest in Britain. Happily, visitors to the house were welcome when Lord Northwick was not in residence and in 1843 the Montpellier Library published a guide to the artworks entitled "Hours in the Picture Gallery of Thirlestaine House, Cheltenham", for 1s 6d. Lord Northwick died in 1859 and his collection was sold off. 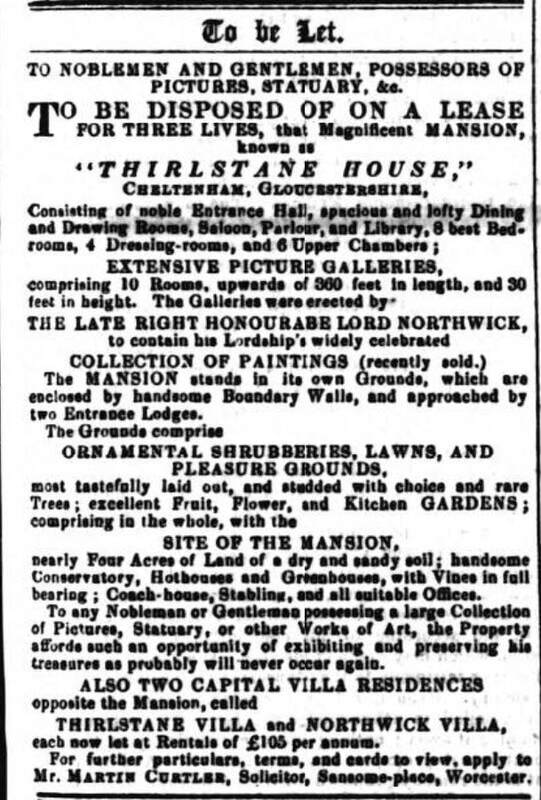 Thirlestaine House was advertised for rent in 1861 and was eventually bought in 1863 by Sir Thomas Phillipps, a Governor of the British Museum, to house his enormous collection of books and manuscripts, said to exceed 100,000. On his death the house passed through his daughter Katherine to the Fenwick family, who sold it to Cheltenham College in 1947 for £31,326. If you have any further information or photographs of this property please let us know via the contacts page.